Pinterest for Business is Probably the Most Powerful Tool as a Replacement of Google Image Search. Let us think about the dimensions. It is a known fact today; due to huge number of Adverts, misleading Titles and Descriptions on Google Web Search, many advanced users perform Google Image Search to get the right result seen before clicking. Google, fortunately never thought (yet) to insert their Adverts or abnormal algorithmic filters – the results are usually great and works. Definitely, this is not the major reason behind the launching idea about Pinterest. Infographics were well known to be working beforehand. Indeed, in deviantArt, the tutorials are written in graphical format like Infographics by the members. If we think in a roundabout way, deviantArt is successful only for Graphics, so it was probably a straightforward that Pinterest will be successful. Pinterest is a Big Lesson on Scalability – the article itself reveals another dimension of Pinterest. Pinterest started a very nice and easy way to add a tick mark beside a profile – just have a website. There are many very minute points where Pinterest gives importance to all – from a Blogger to a Bigger Brand. In the Business Type drop down on Contact us page, there is a distinct category – Blogger. Numerous peoples made contact with us for re-using our resource for their business purposes. Pinterest, for this website did very good job which basically Google failed. We have quite good number of illustrations which has 1K+ Pins, Likes etc. 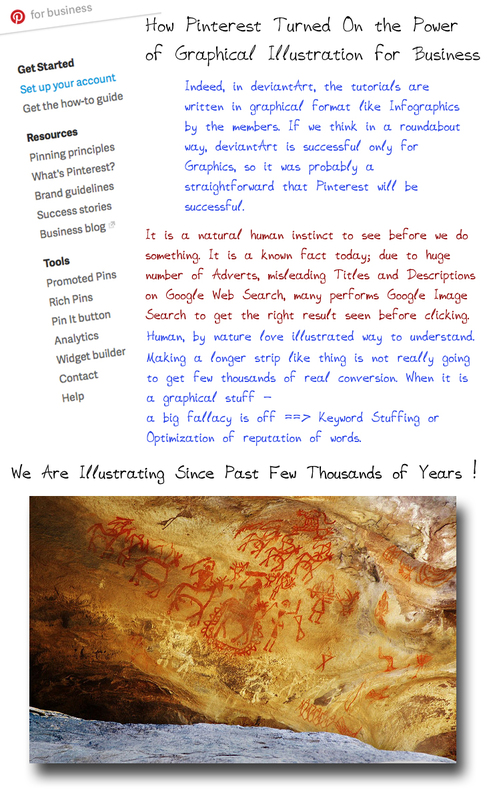 It is fact that, good infographics get better attention to the serious users without any extra effort on Pinterest. Explaining how it works in a visual manner automatically draws the attention. You really can not say, the graphical representation is not important to article like this one – What Camera Mode to Choose Depending on the Situation?. Google failed to detect the usefulness, but Pinterest opened the resource to the interested audience. This Article Has Been Shared 5224 Times! Cite this article as: Abhishek Ghosh, "How Pinterest Turned On the Power of Graphical Illustration for Business," in The Customize Windows, March 28, 2014, April 26, 2019, https://thecustomizewindows.com/2014/03/how-pinterest-turned-on-the-power-of-graphical-illustration-for-business/.